"What the heck is bacon jam?…. About 3 years ago, we started a street food company called skillet street food. We focused on creating chef driven food, out of an airstream trailer. One of our signature items was our burger, which was grass fed beef, arugula, brioche, cambozola cheese and Bacon Jam. People started asking us if we sold it, and after a brief period of time we started to sell it on our street food trailer ……. …….we take a big bunch of really really good bacon, and render it down…add a bunch of spices..onions, etc..and let it simmer for about 6 hours…give it a quick puree, blast chill it…and you have bacon jam..
We like to put it on our burger, serve it on crostini, perhaps on a grilled cheese, maybe a substitute for bacon on a BLT, maybe the base for a vinaigrette…well you get the picture…"
Made from niman ranch bacon, onions, balsamic, and additional spices and simmered for six hours, pureed, and chilled, and the result: Skillet Bacon Jam! Skillet Bacon Jam claims to have a smoky, savory, tangy, flavor with a hint of sweetness! Since I'm a vegetarian I didn't try this product, but that doesn't mean that it's not good. My mother eats meat and enjoys bacon on the rare occasion. It's not fun having to cook bacon, and have the fat splattering all over the stove... Bacon jam takes the fuss out of having to prepare it. I will be adding this item to her Christmas stocking, and I will let everyone know how she likes it! 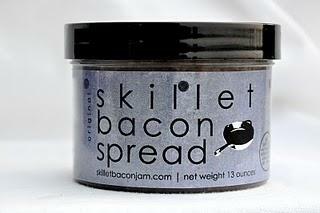 An 11 oz container of Skillet Bacon Jam can be purchased for only $13. Click here to make your purchase! My family would be so all over this! I might have to get it for their stockings!